Alfred Cellier was a contemporary of Arthur Sullivan as a Chapel Royal chorister, and would later conduct several Gilbert and Sullivan productions. 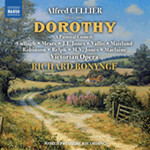 With its rural tale of disguise and romantic scheming, its jaunty tunes, lively characters and farcical comedy, Cellier's light opera, Dorothy, has been almost entirely forgotten today. It had the longest run of any 19th-century piece of musical theatre, seeing off The Mikado and Ruddigore, and became such a popular hit in its day that the box office profits were able to fund the building of the Lyric Theatre on London's Shaftsbury Avenue.